The sample that ships with the Toolkit uses the CascadingDropDown with an XML data store. A common question is how to use it with a database. This walkthrough will demonstrate that. First, create a new ASP.NET AJAX Website, and add a reference to the toolkit assembly. You'll find the assembly (called AjaxControlToolkit.dll) in the "AjaxControlToolkit\bin" directory where you installed the toolkit. The knownCategoryValues parameter will return a string containing the currently selected category values, as well as the category to retrieve values for. For example, if the extender is populating the "Color" field, you will be passed the values for the "Make" and "Model" fields, as well as "Color" to specify the field to return values for. This method will return a StringDictionary containing the name/value pairs of the currently selected values. So imagine you've got a database with tables for the Make (manufacturer), Model, and Color information, and you're accessing that database through a DataSet to which you've added methods for getting each set of values.
} So it's simple to return the values. Note that the values are returned as an array of CascadaingDropDownNameValue structures. This structure also includes an isDefaultValue boolean field that allows the specification of which value should be selected when the list is first displayed. 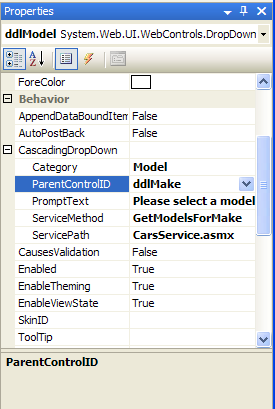 ServiceMethod="GetCarMakes" /> If you look at this it's pretty simple. TargetControlID specifies which control we're extending, in this case it's the drop down that specifies the manufacturer or "make" of the car. PromptText specifies the text to show in the dropdown when no value is selected, and the ServicePath and ServiceMethod attributes tell the extender which web service to call to fetch its values. Note the "ParentControlID" property which specifies which DropDownList is the "parent" for this one. By setting these parent values, you can chain or "cascade" these values, and the CascadingDropDown extender will automatically manage setting, clearing, and loading the data for you. Category="Color" /> Once you've completed your web service methods, your cascading drop down is complete! Finally, in order for the values to be submitted, EventValidation needs to be disabled for the page. EventValidation ensures that the values in each control match the values that were present when the page was rendered, but since these drop downs are populating on the client side, this is never true. We’re hoping to find a way to resolve this issue but please ensure that you understand the potential risks of this and validate the data appropriately in your post back when using this control.